At the start of the month, 7,000 headteachers from across the country wrote to nearly 3 million parents to explain the extent of the cuts they have faced and why they are being asked to help pick up the slack. Figures from the Institute for Fiscal Studies show that overall school funding has slumped by 8% in real terms since 2010 and sixth form colleges have seen funding cut by 21% in the same period. This has resulted in a number of unprecedented measures, such as schools closing at 1pm on Fridays; rationed photocopying; teachers standing in for cleaners and even delays to turning on heating, even in the depths of winter. Here at Racing to School, our mission is and always has been to provide a free-to-user and inclusive educational events. 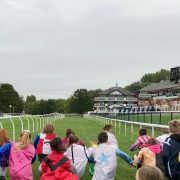 Our Programmes are designed to enrich curriculum-focused learning, while at the same time, introduce young people to engaging in the sport of horseracing. We have always received very positive feedback from teachers about our events, with a regular comment being that so few school trips like this are available to them. Recent events suggest that this may be more important than ever. The Social Metrics Commission (SMC), an independent body bringing together poverty specialists from across the political spectrum, released a report last year that indicated 4.5m children are currently living in poverty – that is one in every three young people. In practice, this means that schools are offering less school trips and outdoor learning activities and, when they do, parents are asked to cover the cost. It is likely that the most disadvantaged young people will miss out on these opportunities and have their education affected as a result. Against this backdrop, the charity is pleased to report that last year 52% of our activity reached pupils from inner city, rurally isolated or deprived areas.